SpaceX’s Falcon 9 rocket blasts off from Cape Canaveral on Oct. 7.
Who cares whether NASA or a private contractor is in charge of shuttling cargo to and from the International Space Station, as long as they bring ice cream? 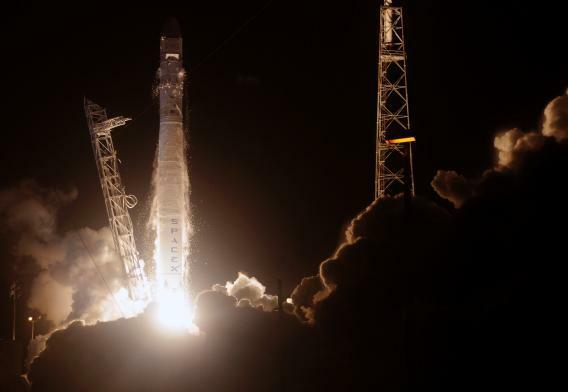 On Sunday night, SpaceX’s unmanned Falcon 9 rocket blasted off from Cape Canaveral, Florida, carrying a Dragon cargo capsule into orbit in its first official resupply mission. MSNBC reports it’s expected to link up with the International Space Station on Wednesday, bringing some 900 pounds of essential gear, including science experiments, health care equipment, and cups of Blue Bell chocolate-vanilla swirl ice cream. SpaceX, a private Southern California-based company founded by billionaire entrepreneur Elon Musk (who also founded the electric-car company Tesla), has a $1.6 billion contract from NASA to perform 12 routine cargo resupply missions to the space station between now and 2015. This is the first official mission, following a successful test run in May. SpaceX is also among three private companies vying to become NASA’s choice for shuttling humans into space. The other two are Boeing and Sierra Nevada. The Dragon will spend about three weeks in space before splashing down in the Pacific with twice as much cargo as it brought, trading the ice cream for, among other things, astronauts’ blood and urine samples.